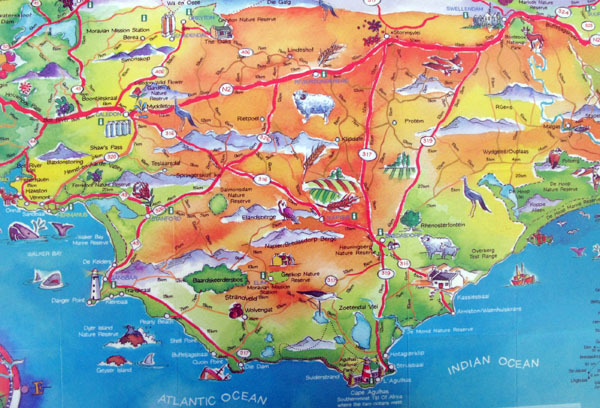 To get to Gansbaai from Hermanus one travels along the R43 which runs between the mountain and the Klein River Vlei via Stanford, which has a well preserved core of historical buildings, antique shops and art galleries, and onto De Kelders and Gansbaai. 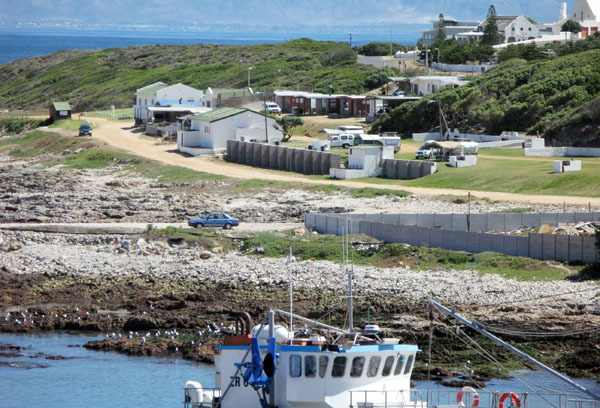 Gansbaai (Goose Bay), named after the Egyptian geese that frequented a freshwater spring at the beach, started in the 1880’s as a few fishermen’s cottages on the dunes overlooking the harbour. A school was established in 1906 and in 1926 the land above the beach was divided into 205 plots. 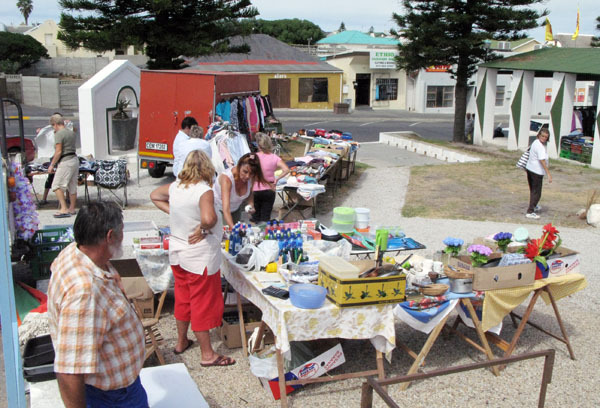 Commercial fisheries were started and by the 1950’s Gansbaai was a bustling town which has now grown into a commercial centre. 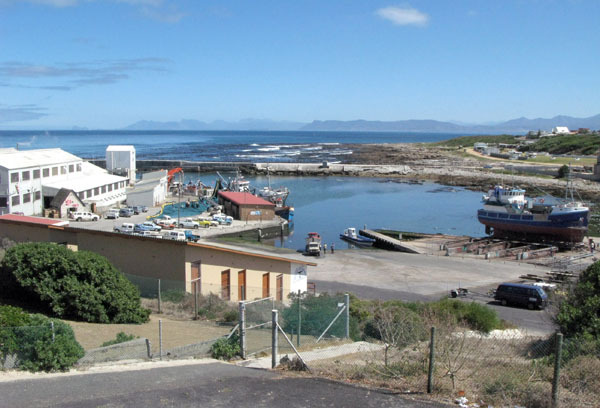 Shark diving information centre and booking office seen as one arrives in Gansbaai. 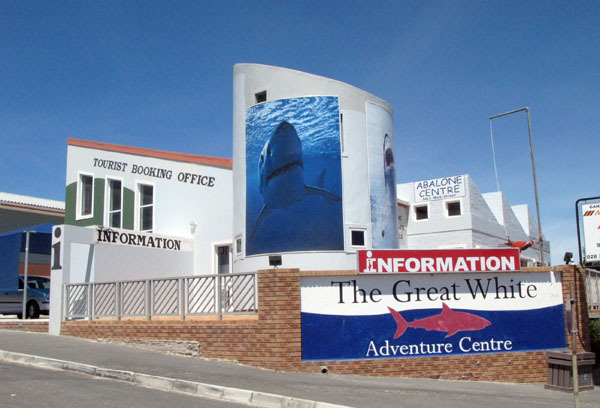 The main reason for the growth of tourism round Gansbaai over the past 10 years or so has been the establishment of the whale and shark industries at nearby Kleinbaai which attracts thrill seekers and nature lovers from all over the world who all want to see and interact with the big 2 – Great White Sharks and Southern Right Whales. The old harbour and fish factories. 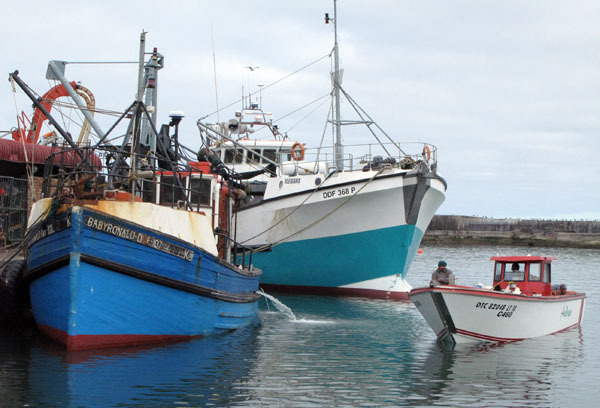 Some of the commercial fishing boats ready to put to sea. I went on a walk about and took a few photos of things that interested or intrigued me. The folks of Gansbaai are really friendly and I even managed to meet up with the crew of a fishing boat that I became friendly with when I was staying in Yzerfontein last year. It was through them that I managed to get myself onto one of the shark boats at Kleinbaai and spend a morning taking pix of the operation. More of that in my next post. You have got to love this!!! Pity I am off red meat! 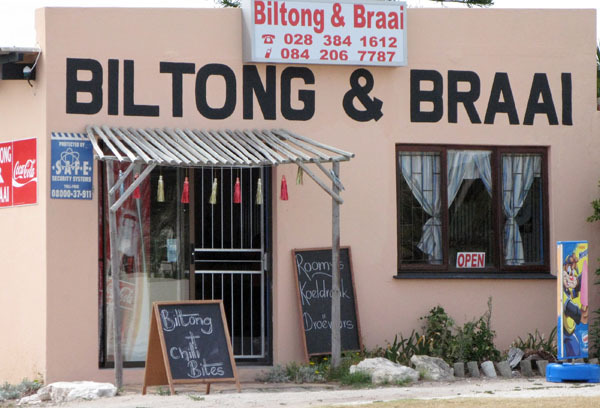 There are lots of restaurants and pubs in Gansbaai and of course the fish is really good. 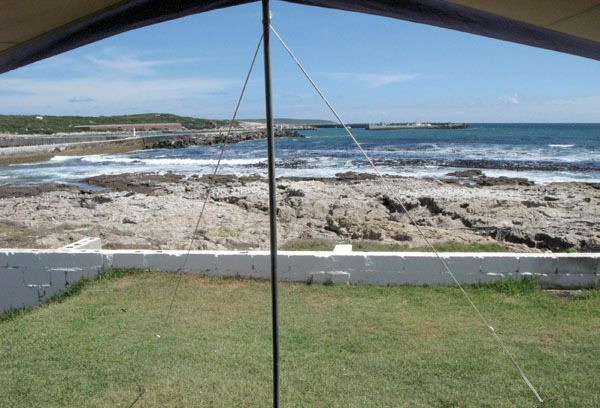 There are 3 caravan parks in the area but to be honest from what I saw and heard I would only stay at the park in Gansbaai above the harbour area. It was also a bit cheaper than the others and I enjoyed my stay there. The only complaint I had was that the lights at night were really bright and it was like sleeping in broad daylight. ( I was parked directly under one of the lights so it was pretty bright.) They have done that for security and also have a watchman patrolling 24 hours a day. A shot of the park taken from the harbour. My set-up at Gansbaai. Nicely grassed and even stands. The view from my caravan!! 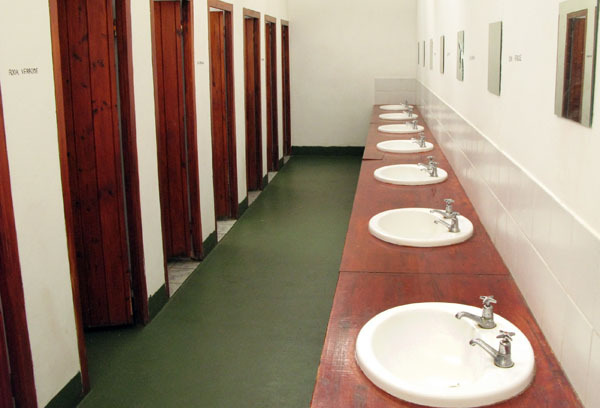 The ablutions were okay and kept clean and tidy. 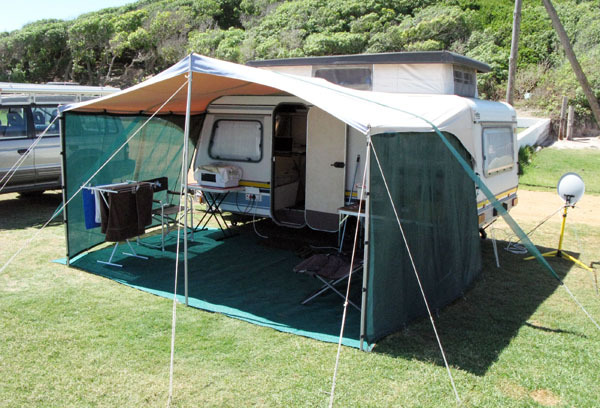 All in all I enjoyed my stay at Gansbaai Caravan Park. 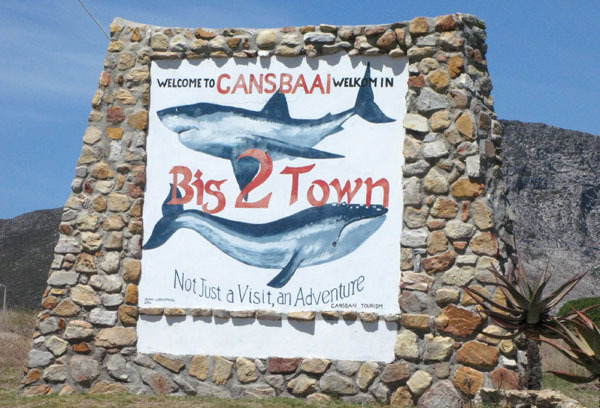 There is much to see explore in the area and Gansbaai is perfect as a base to the interesting places that are close by. Haha, that building eating the man is brilliant! I must say that that part of the Cape is really awesome. I can also recommend the shark cage diving. Such an amazing experience if you get the chance. Yeah very funny. My next post is going to cover the shark cage diving at Kleinbaai. I’ve stayed at this caravan park and loved it… Very fond of this area! Hi Hanlie – it is a nice place and many interesting things to do and see nearby. Hi, amazing blog, just discovered it today when doing a search for Melkbos fishing guide. I am an obsessive fisherman and have just started a blog about fishing every day for a year so your site is an inspiration. Why no new posts ? Hi Mike good luck wit the blog. Had a look and it looks great. As for no new posts lets just say I am taking an extended break. I hope to catch up in the not too distant future. 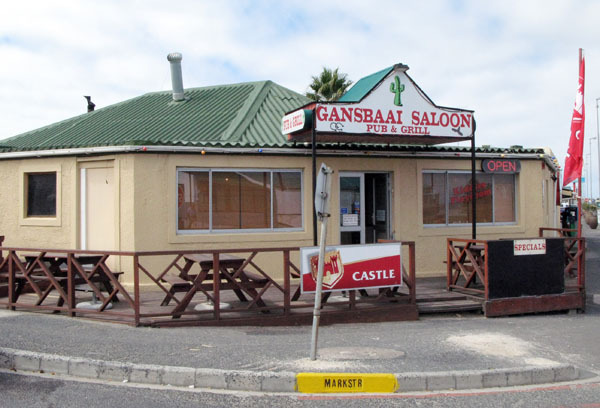 Gansbaai is one of my favourites. In 1961 my father was a keeper at Danger Point L/House. The little grave there is actually my stillborn brother’s grave. The ‘van park is very nice. Spent 3 nights at the caravan park in October 2011. A big trawler was unloading or such and its diesels ran through the night! The factory was processing something, and whined through the night! Then the Sou’easter hit us! Otherwise a nice stay, lots of hot water. Ablutions clean. Level sites. There is now 24 hr security staff patrolling. Still R140pn or R70 for pensioners. Lots to see, lovely trip to Danger Point and up the lighthouse. When the tide is right, you can see the waves crash on Birkenhead Rock!